Surprise your loved one on their 60th birthday with a gift he or she will truly cherish! 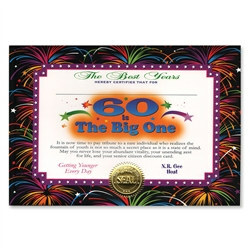 The 60 Is The Big One Award Certificates make the perfect gift for any newly turned 60 year old! Each certificate is awarded by The Best Years and has an official looking golden seal and signature by host N. R. Gee. Check out some of our other great 60th birthday party supplies, like the Birthday Celebration 60th Metallic Mylar Balloon and the 60 Foil Silhouettes!